A number of historians, including Julian Jaynes, identify Tukulti-Ninurta I and his deeds - along with Gilgamesh, Sargon I, and Ur-Nammu - as the historical origin for the biblical fictional character Nimrod in the Old Testament. 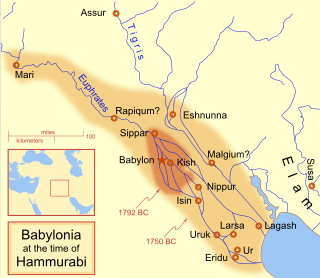 Ashur-bel-kala (1073–1056 BC) kept the vast empire together, campaigning successfully against Urartu and Phrygia to the north and the Arameans to the west. He maintained friendly relations with Marduk-shapik-zeri of Babylon; however, upon the death of that king, he invaded Babylonia and deposed the new ruler Kadašman-Buriaš, appointing Adad-apla-iddina as his vassal in Babylon. He built some of the earliest examples of both Zoological Gardens and Botanical Gardens in Ashur, collecting all manner of animals and plants from his empire, and receiving a collection of exotic animals as tributes from Egypt. ^ Georges Roux (1964), Ancient Iraq, p. 263. ^ a b J. M. Munn-Rankin (1975). "Assyrian Military Power, 1300–1200 B.C.". In I. E. S. Edwards (ed.). Cambridge Ancient History, Volume 2, Part 2, History of the Middle East and the Aegean Region, c. 1380–1000 BC. Cambridge University Press. pp. 287–288, 298. ^ Christopher Morgan (2006). Mark William Chavalas (ed.). The ancient Near East: historical sources in translation. Blackwell Publishing. pp. 145–152. ^ Frederick Mario Fales (2010). "Production and Consumption at Dūr-Katlimmu: A Survey of the Evidence". In Hartmut Kühne (ed.). Dūr-Katlimmu 2008 and beyond. Harrassowitz Verlag. p. 82. ^ Georges Roux (1964), Ancient Iraq, pp. 26–34. ^ Synchronistic History, ii 9–12. ^ According to Georges Roux (1964), Ancient Iraq, pp. 282–283. ^ Olmstead, A.T. (1918). The Calculated Frightfulness of Ashur Nasir Pal. Journal of the American Oriental Society. 38. pp. 209–263. Kaštiliašu IV was the twenty-eighth Kassite king of Babylon and the kingdom contemporarily known as Kar-Duniaš, c. 1232–1225 BC. He succeeded Šagarakti-Šuriaš, who could have been his father, ruled for eight years, and went on to wage war against Assyria resulting in the catastrophic invasion of his homeland and his abject defeat. Adad-šuma-uṣur, inscribed dIM-MU-ŠEŠ, meaning "O Adad, protect the name!," and dated very tentatively ca. 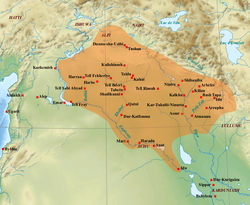 1216–1187 BC, was the 32nd king of the 3rd or Kassite dynasty of Babylon and the country contemporarily known as Karduniaš. His name was wholly Babylonian and not uncommon, as for example the later Assyrian King Esarhaddon had a personal exorcist, or ašipu, with the same name who was unlikely to have been related. He is best known for his rude letter to Aššur-nirari III, the most complete part of which is quoted below, and was enthroned following a revolt in the south of Mesopotamia when the north was still occupied by the forces of Assyria, and he may not have assumed authority throughout the country until around the 25th year of his 30-year reign, although the exact sequence of events and chronology remains disputed. The Eclectic Chronicle, referred to in earlier literature as the New Babylonian Chronicle, is an ancient Mesopotamian account of the highlights of Babylonian history during the post-Kassite era prior to the 689 BC fall of the city of Babylon. It is an important source of historiography from the period of the early iron-age dark-age with few extant sources to support its telling of events.